Jim Dale: The Voice of Harry Potter We speak with Jim Dale, whose voice is well known to those who've picked up the audio version of any Harry Potter book. 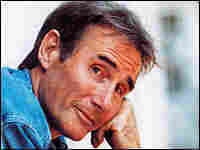 We speak with Jim Dale, whose voice is well known to those who've picked up the audio version of any Harry Potter book. In Harry Potter and the Half-Blood Prince, the sixth and latest installment of the series, Dale tackled 117 different characters, including Snape and Wormtail.